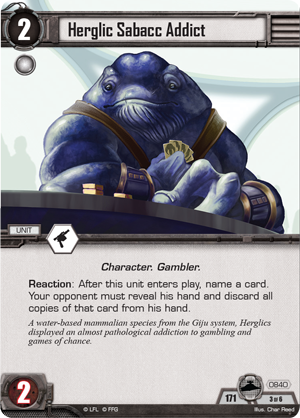 Under the leadership of its newest Baron Administrator, Cloud City has become a centerpiece of luxury and high-class gambling in the Outer Rim. Ritzy clubs and hotels cater to the ultra-rich, but anyone who wants to play a hand of sabacc or toss the dice in hintaro can find somewhere to take their credits in Cloud City. Here, the smugglers and spies of the galaxy can live their lives with some measure of freedom from Imperial oppression. Here, you can take a gamble and strike a blow against the dark side. 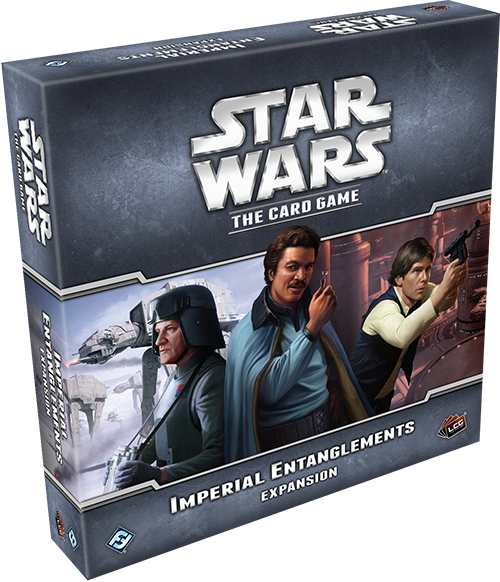 Both the Imperial Navy and the galaxy’s Smugglers and Spies enter the spotlight in the new Imperial Entanglements deluxe expansion for Star Wars™: The Card Game. 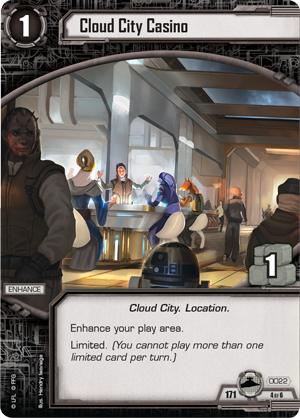 In today’s preview, we’ll enter the high-end casinos of Cloud City and gamble for the fate of the galaxy. Ostensibly, random chance and player skill lie at the heart of every gambling game, but the house always seems to hold the advantage. Fortunately for the light side, the current Baron Administrator of Cloud City is none other than Lando Calrissian, a notable gambler and scoundrel. On Cloud City, when the house wins, Lando wins. 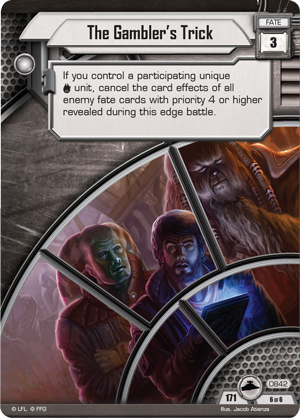 One new objective set in Imperial Entanglements invites you capitalize on the Lando’s house advantage in Cloud City. Fittingly, the first card in the set is House Edge (Imperial Entanglements, 838). House Edge forces your opponent to play by chance in what is normally a carefully considered part of the game: the edge battle. While House Edge is undamaged, it gains a powerful Interrupt: when your opponent would choose a card from his hand to place in an edge stack, he must choose that card at random instead! This ability can only be triggered once per turn, but the consequences of a random card placed in the edge stack can be catastrophic. Perhaps your opponent will randomly choose a powerful event he was saving, or a main unit he hoped to play next turn. 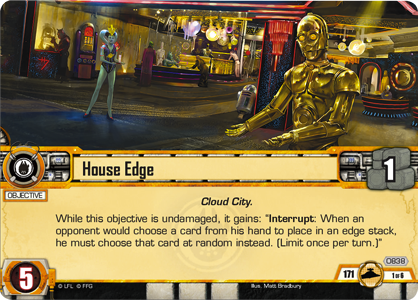 Even if your opponent ultimately wins the edge battle, your House Edge may carry the day when you’re playing in a Cloud City Casino (Imperial Entanglements, 22). 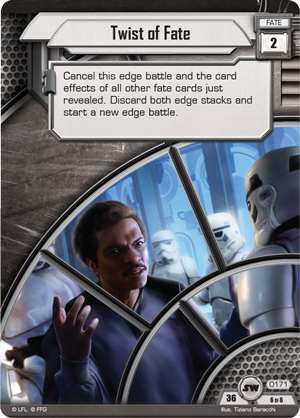 Essentially, Lando challenges your opponent to take a chance and gamble for the opportunity to unfocus one of his cards. Although either player can “win” this gamble, you choose the timing, which gives you the advantage. First of all, Lando’s ability forces your opponent to discard at least one card. You may use this ability after your opponent refreshes all his units, forcing him to discard a card he saved from last turn, but denying him the reward if he does reveal more Force icons. You may also use Lando’s Action during your conflict phase, potentially allowing one of your units to strike twice if you can reveal more Force icons than your opponent does. At the heart though, Lando Calrissian invites you to bluff your opponent. 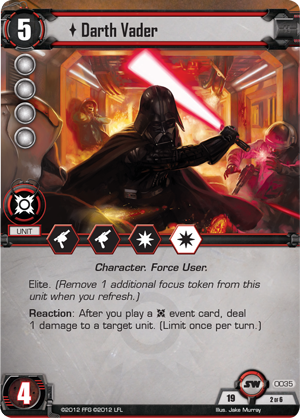 If you can convince him that you truly need a unit unfocused, you may play a card with zero Force icons while he plays a high-icon card like Darth Vader (Core Set, 35). 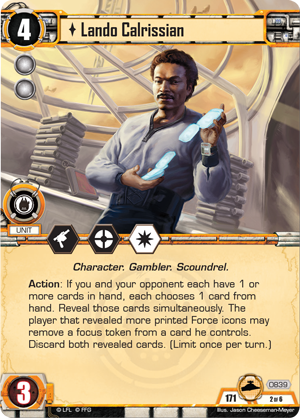 More than straight gambling though, a scoundrel like Lando loves a sure gamble – where you know every move your opponent can make and you can stop him from ruining your game plan with a single card. You can accomplish this with the help of the Herglic Sabacc Addict (Imperial Entanglements, 840). After this unit enters play, you can name any card. Your opponent must then reveal his hand and discard all copies of that card from his hand! The applications of this card are limited only by the cards existing in the game. By the time you play the Herglic Sabacc Addict, you’ll already know a good portion of your opponent’s deck from his revealed objectives and the cards he’s played. With the Herglic Sabacc Addict, you can protect yourself from unwanted tricks. Perhaps a Twist of Fate (Core Set, 171) or a Seeds of Decay (Knowledge and Defense, 514) would ruin your attack plans – play the Herglic Sabacc Addict and ensure your opponent doesn’t have those cards in hand. What’s more, you also see your opponent’s entire hand after you name a card, meaning you know exactly what events he has and how many Force icons he can commit to an edge battle. Even if you don’t discard any cards with the Herglic Sabacc Addict, knowledge of your opponent’s hand is often worth the risk. Perhaps you look at your opponent’s hand and see nothing but danger: punishing fate cards, deadly events, and high Force icon cards for winning edge battles. In that situation, it might be a good time to trigger a Sabacc Shift (Imperial Entanglements, 841). You can only play Sabacc Shift on your turn and it forces your opponent to shuffle his hand back into his deck and draw an equal number of cards. 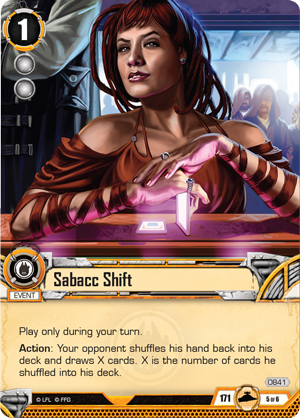 By using Sabacc Shift at the right time, you may completely destroy your opponent’s game plan and force him to make a fresh start with inferior cards. You won’t always have a Sabacc Shift handy, though, and your opponent’s fate cards might ruin your carefully crafted scheme. You could try to discard enemy fate cards with Twist of Fate, but you’d have to tempt your opponent into playing them first. A better course of action might be to use one of the new fate cards included in this deluxe expansion: The Gambler's Trick (Imperial Entanglements, 842). If you have a unique Smugglers and Spies unit participating in the engagement, The Gambler’s Trick cancels the card effects of all enemy fate cards with a priority of four or higher! So while it won’t affect an enemy Twist of Fate, The Gambler’s Trick will cancel enemy fate cards while leaving your own untouched. If your opponent was depending on a fate card to win the fight, The Gambler’s Trick can save you. The smugglers, gamblers, and scoundrels of the galaxy may hold the upper hand in places like Cloud City, but the Imperial Navy stretches across the galaxy, commanding unlimited resources and countless warriors. 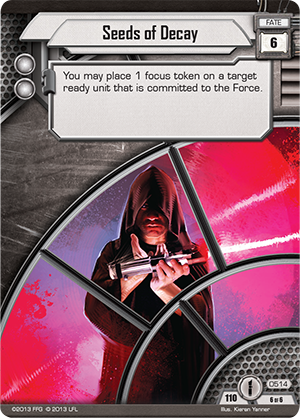 In our next preview, we’ll join the commanding officers of the Imperial Navy as they enforce loyalty in any systems that dare to diverge from the Empire. Pre-order Imperial Entanglements at your local retailer today!